Amen end the prayer ? ?it is a name of egyptian SUN g-d amen-ra!!!! Amen, End of Prayer or Egyptian God ? We would like to take the time to mention about a word that we feel is wrong to use, as the bible tells us not to use the names of pagan gods. Exodus 23:13 And in all that I have said unto you be circumspect: and make no mention of the name of other gods, neither let it be heard out of thy mouth. When the scriptures were translated, first into Greek, then into Latin, and from there into English, the translators have changed the name of the Almighty Yahuah, to the name LORD, and changed the name of the Messiah, his son, from Yehowshuwa Ješua , to the incorrect name of Jesus Christ. They also added the name Amen, so that people unknowingly end up worshiping a false G-d.
Luke 11:2 And he said unto them, When ye pray, say, Our Father which art in heaven, Hallowed be thy name. Thy kingdom come. Thy will be done, as in heaven, so in earth. Give us day by day our daily bread. And forgive us our sins; for we also forgive every one that is indebted to us. And protect us from temptation; but deliver us from evil. Matthew 6:9 After this manner therefore pray ye: Our Father which art in heaven, Hallowed be thy name. [ his name is YAHUAH] Thy kingdom come. Thy will be done in earth, as in heaven. Give us this day our daily bread. And forgive us our debts, as we forgive our debtors. In Matthew, they added the word Amen to the end. The word Amen in my opinion should not be added to the end of any prayer, because this is a name of an Egyptian god, meaning 'the hidden'. This deity of Egypt is mentioned in Nahum 3:8 as populous of No. And in Jeremiah 46:25 as mutitude of No. In the Strong's Concordance in Hebrew #527 as amown populous and multitude. And #528 Amown an Egyptian god, originally the local god of Thebes, later head of the Egyptian pantheon. It was never used at an end of a prayer, this tradition is brought about in the Rabbinical Jewish Talmud, which also prohibits the people from using the true name of the Almighty YHWH, and told to substitute it with the word adonay instead and then the people are told to use the word Amen at the end of a prayer. Which is what most Christian churches also do, and the Muslims and most of the secret societies. According to the Encyclopedia of Judaism, Amen was never used in the First Temple era. It was during and after the Second Temple era that it became part of their Liturgy. By adding this word to the end of a prayer it would sound like you are praying to and invoking the Egyptian deity Amen. Also known as Amen-Ra. Which means Amen the sun god. Remember we are to use the true names, and no other, YAHUAH the Father, and YAHUSHUAfor his son. 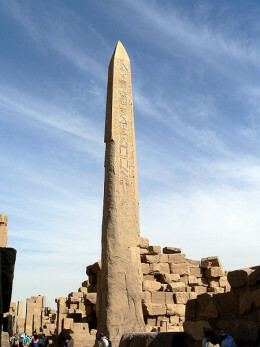 Another thing I would like to mention is the Obelisk, which is where the sun god Amen-Ra is claimed to reside. He was worshiped as the creator god in Egypt. 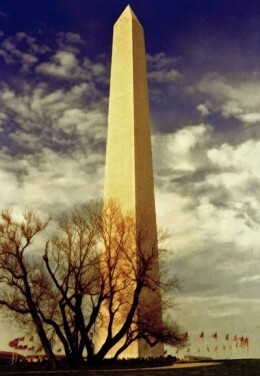 They claimed that he actually resides in the Obelisk so therefore the places that have an obelisk are worshiping the sun god Amen. There are three city states in the world that are like a sovereign city within Country, or State. And each of these three cities have an Obelisk. 1. Vatican, 2. Washington DC., 3. City Center of London. Here we have the Roman Catholic, the Protestant, and the Anglican, all three appear to be worshiping the god Amen. Why else would they have these Obelisks. The one in London coming all the way from Egypt. All these religions end there prayers with Amen. Also Secret Societies, when saying their ritual prayers, they too end it with Amen. This appears to me to be the reason for omitting the true name of the Almighty YAHUAH and adding to the bible the false name Amen, and you may notice that it is always with a capitol A in the KJV, thus making this word a proper noun, like a name. Also notice that this is one of the few words that has not been translated, but has been transliterated. It is also the most known word in the World. Also worthy of note is that the Jews, the Christians, and the Muslims end their prayers, with the word Amen. They are all worshiping a false God, the highest angel, the Devil. Satan, the master deceiver, has been out to deceive all people. Satan was also the highest angel, so he is very clever. He would deceive the very elect if it were possible. Joshua (Yehowshuwa) 24:14 KJV Now therefore fear JAHUAH, and serve him in sincerity and in truth: and put away the gods which your fathers served on the other side of the flood, and in Egypt; and serve ye JAHUAH. 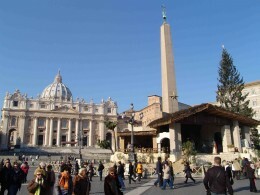 Obelisk at the Vatican is a sundial to track their god Amen the Sun god. 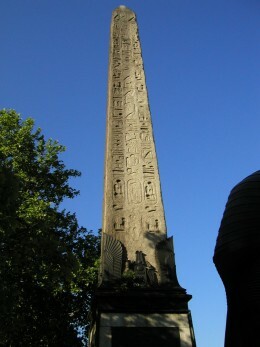 This obelisk is from Heliopolis. The city of the sun. New statue erected in Luxor. Amenhotep lll and his wife. An Egyptian Pharaoh who's title means Amen is satisfied. In Egypt there was a major cult that worshiped the Sun god Amen, also called Amen-ra. 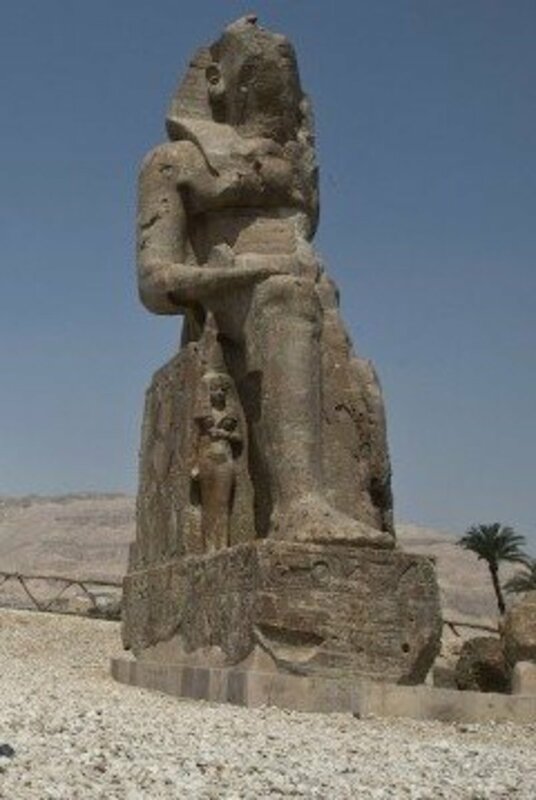 The largest cult of Amen was the city of Thebes now called Luxor, Amen was also identified with the Ram. The cult of Amen consisted of three Egyptian gods, Amen, Mut and their son Khonsu. Also known as the Theban Triad. This cult of Thebes was mentioned in the bible in Jeremiah. The "multitude of No" means the "cult of Amen of Thebes". Ezekiel 30:14 And I will make Pathros desolate , and will set fire in Zoan, and will execute judgments in No. And I will pour my fury upon Sin, the strength of Egypt; and I will cut off the multitude of No. And I will set fire in Egypt: Sin shall have great pain , and No shall be rent asunder , and Noph shall have distresses daily. The young men of Aven and of Pibeseth shall fall by the sword: and these cities shall go into captivity. At Tehaphnehes also the day shall be darkened , when I shall break there the yokes of Egypt: and the pomp of her strength shall cease in her: as for her, a cloud shall cover her, and her daughters shall go into captivity. Thus will I execute judgments in Egypt: and they shall know that I am JAHUAH. 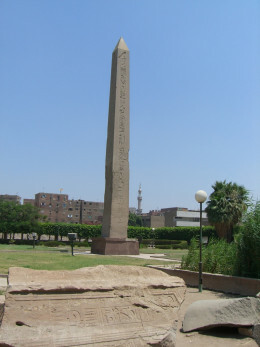 And mentioned as "Bethshemesh" hebrew for "House of the Sun"
Heliopolis is where the obelisk at St. Peter's square originally came from. It was built by the Pharaoh Mencares in 1835 BC in honor of the sun, it was brought to Rome in 37 BC by the Emperor Caligula and erected in the circus he built. 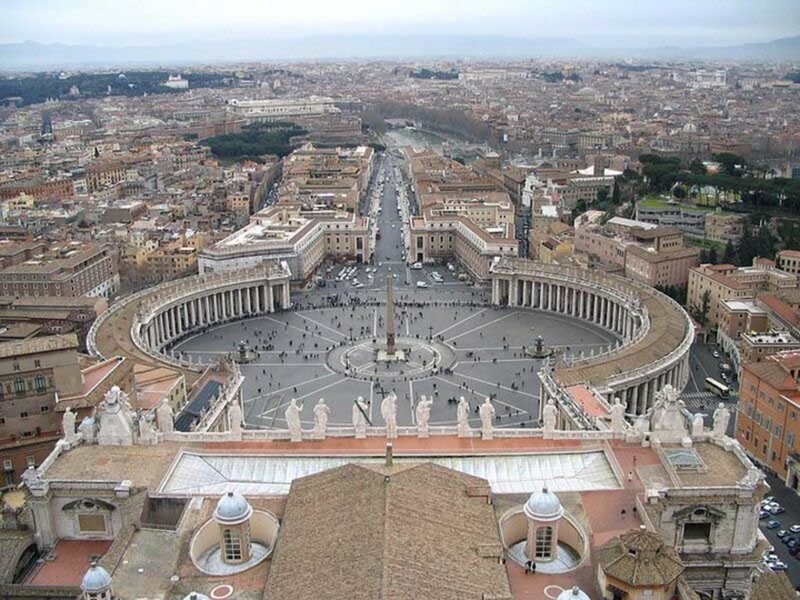 And in 1586 Sixtus V had it moved to the center of St. Peter's Square. The obelisk is a sun worship idol were their god Amen resides, coming from the "city of the Sun"
The Catholic religion is the same as the religion of the Cult of Amen. Sun worship. The true name of the messiah is YAhowshuwa, (יְהוֹשׁוּע) before the MASHIJAH returned to his Father JAHUAH in heaven, he warned his disiples that they would be persecuted for his name's sake. So many of the true followers of YahUSHUA (JEŠUA HAMAŠIJAH) were persecuted and killed, and by the time Constantine came into power, (who himself worshipped the Sun, Sol Invictus), the true name of the MASHIJAH YAHUSHUA, was replaced with the false name Iesous Christos, also known as Amen. This is why prayers end with the word Amen, it is a continuation of the cult of Amen. Constantine continued the sun worship religion of the cult of Amen, that in 321 AD he put into law that all shops and businesses close on the venerable day of the sun, Sunday. And in 325 AD they incorporated the falseTrinity doctrine to facilitate the Amen's cult need of the three Egyptian gods in one. Amen, Khonsu and Mut . Father and Son and Mary (holy ghost), that is why the Catholic church worship and venerate Mary and even call her Queen of Heaven a pagan title mentioned in the bible. Pope Francis himself calls Mary his Mother. 'Mut' means 'Mother'. That would make Pope Francis the high priest of the cult of Amen. The Greeks compared Amen with Zeus and was named Ammon-Zeus. Alexander the Great later wanted to be known as son of Ammon-Zeus. Heliopolis is now modern day Cairo/Chi-Rho. Constantine also employed the Chi-Rho along with the cross as his sign or banner, claiming that Christ told him use it. 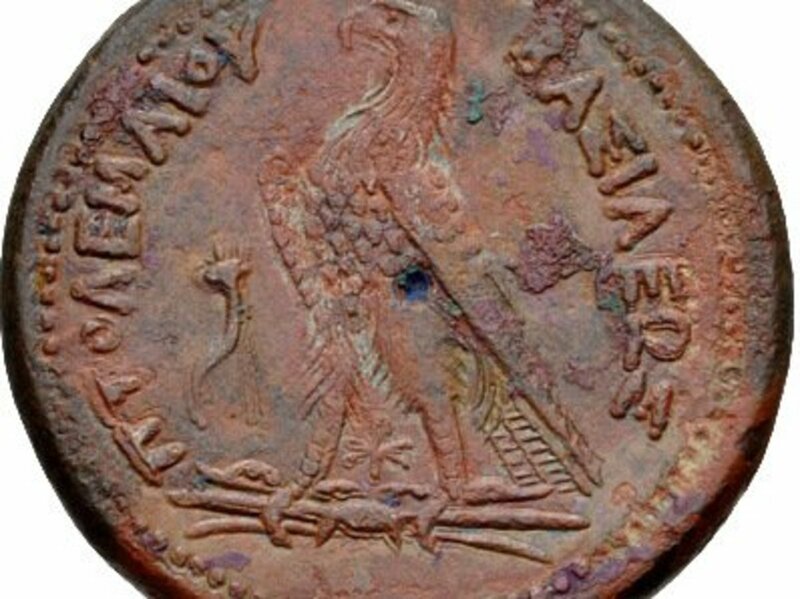 The Chi-Rho was also a symbol on coins with the head of Ammon-Zeus by Ptolemy III Euergetes (r. 246–222 BC). It is said that Gnosticism is a term given to a philosophical movement that flourished between 2nd century BCE to the 4th century CE. It is the Gnostic that tried to incorporate Greek philosphy into the gospels, changing and pulling away the gospel from its Judaism roots. The Gnostic church has its roots in Egypt, they claim that the initiate has to learn the sacrements which they call the sacred Amens. They call this the Trinity or the Cosmic Christ, the Gnostic Church themselves claim that "Amen-Ra or Osiris-Ra is precisely what we invoke when we want to bring down that cosmic force, when we perform the Sacred-Amens, the Sacr-Aments, the Sacraments.... That is why in ancient Egypt when somebody was assimilating these cosmic forces of Amen-Ra, of Osiris-Ra, they will call him or her an Osirified one. In this day and age we call them a Christified one, utilizing the Greek word Christ"
The Gnostic Christian knows full well that they worship Amen-Ra the Egyptian god. The word Amen has been intentionally added to the bible by the Greek philosophers and they also changed the Greek word Messias to Christ. It is an intentional corruption of the gospels. That is why when the orthodox church baptizes someone they also add the word Amen after each person of the trinity, as Father Amen and Son Amen and Holy Spirit Amen. It is the same as Gnosticism. MODERN Christianity is that old Egyptian religion of Amen-ra. So here again the use of Amen is understood by the initiates of the mysteries, but the true meaning is hidden to the ordinary person, but if one reads carefully it states that a person is "to entrust oneself completely to him who is the Amen" They want you to worship Amen the Pagan Egyptian God. The fact is that there were many coptic Christians who had their monasteries in Luxor both on the East side of the River Nile and at Thebes on the West Bank which had a very large population of Coptic Christians in antiquity. They even had a Holy See established at Thebes before the Council of Nicaea in 325 AD. 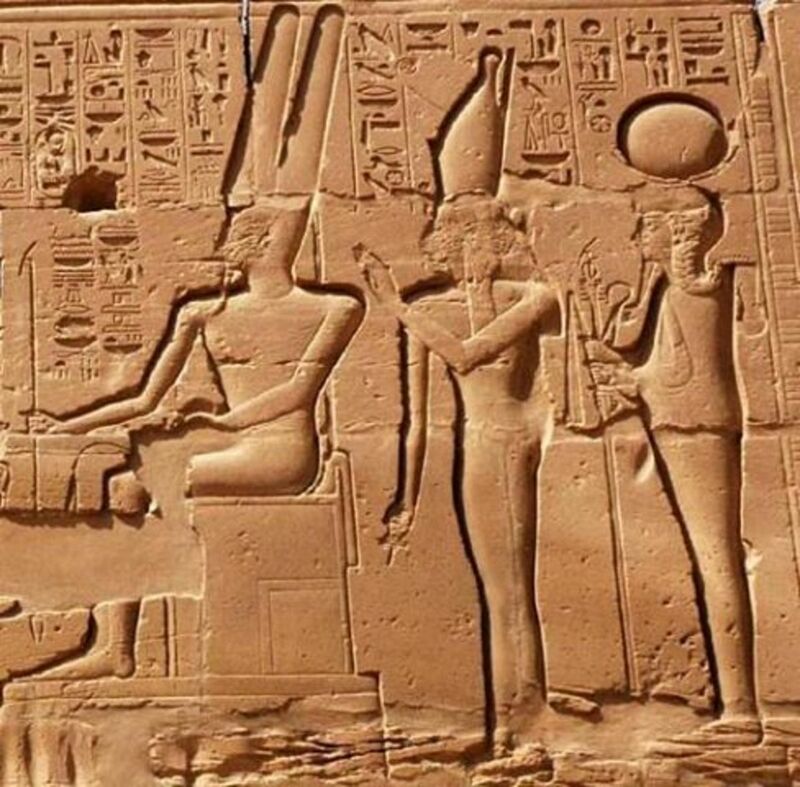 They inhabited and rebuilt temples dedicated to Amen-Ra. The scriptures says repeatedly that we are to worship YAHUAH, YHWH our Creator. And the mashijahYahowshuwa said the greatest commandment is to love Yahuah with all our heart mind and soul. The bible also states that we are not to have the name of false gods coming out of our mouths. This is why we have to seek the truth on our own because s-atan has set a snare of lies. He is a liar and murderer from the beginning. One thing to understand is that we have been lied to. We know that the bible states that s-atan the Devil is the father of lies. So a prudent bible believer should be on the lookout for the lies that s-atan will have us believe. It is folly to believe everything we are told. You will not find the truth from any preacher or pastor in any Christian church because they can't tell you the truth. They have to speak according to the Nicene Creed, they cannot speak differently, if they do they will be replaced. blue beam projekt fake rapture!!!!!! the royals are not human!!! yoga= open door for demons!!! The Khazarian Conspiracy: Fake Jews of the Synagogue of Satan! Islam is sa-tan's cult of evil! The real truth about islam and its false prophet muhammad! DEN A NOC-KDY ZAČÍNÁ DEN!!!! VÁNOCE SATUR SVÁTEK S-ATAN SVÁTEK !!! CO NASTANE ZA MALOU CHVÍLI!!!!!! ANCIENT EGYPTIAN GOD AND HIS NAME WAS AMEN!!!!!!! CHALLENGER SPACE SHUTTLE CREW ALIVE, SAFE & Employed! KDE JE TĚCH 13000 SATELITŮ????!!!! CLONES -ILLUMINATI REPLACE PEOPLE WITH THEIR CONTROLED SLAVES CLONES -WHO IS NEXT????!!!! hollande francois reptilian shapeshifter illuminat! BOOK OF JUBILEES FESTIVALS -Šavuot date!!!! AND CIRCUMCISEON THE 8TH DAY LAW FOR ETERNITY!!!! PAUL FALSE PROPHET -S-ATAN SERVANT!!! IDOLATRY OF CATHOLIC AND ORTHODOX Churches!!! CO SE MÁ UDĚLAT S MODLAMI !!!! s-atan dogma of 666 trinity!!!! CHODEŠ -JAREACH -SLOVO NOVOLUNÍ V BIBLI!!!!! MOŠE LAW VALID FOREVER !!!! JE-SUS IS NOT THE NAME OF MASHIASH!!!! ELIJAH FRIEND OR ENEMY OF JISRAELIES????? talmud kaba-allah -is that a true jisrael???! Copyright © 2019 Seven Roses o.p.s.. All Right Reserve.